These are only a few of many different projects where you might find that normal waste discharge to a sewer pipe is not convenient, or the connection expense would be prohibitive. Perhaps groundwork costs would simply mean that the project couldn’t go ahead. Luckily, we can offer a terrific solution, at a truly competitive price, one that can allow you to go ahead with the improvements you want. This terrific twin sectioned box with its own built-in macerator pump is ready to install in your home. 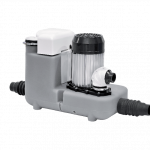 This pump grinds and discharges water right up to 100C, and also deals effectively with both body waste and toilet paper, plus both grease water and acid. 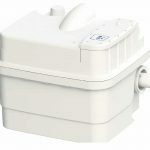 This pump can work in either a kitchen, bathroom or utility room location connecting to the nearest soil stack or sewer through a small 32mm or 40mm diameter pipe, and it will pump both horizontally and vertically. 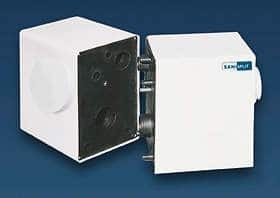 Using this superb product allows you the freedom to add to that loft conversion or utility room creation, as well as to a range of current home locations. It’s piping can be easily hidden behind 50mm stud walling, and there’s no external clips, valves, joints or the like. 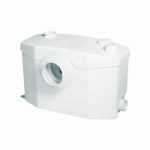 The unit can also be quickly detached without having the hassle of dismantling other pipe work. It doesn’t even need to be located right beside the device or fixture it is being used with. 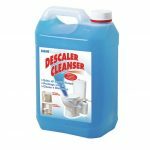 To order this terrifically useful product, and make the changes you want to your home. Order a Sanisplit it without delay, we source truly competitive prices. If you need to know more, or have a technical question before ordering, just email our helpful, experienced and professional team.